Includes how-to's on: three types of clay; armatures; bases; style points; finishing techniques; foundry terminology; suppliers; etc. Also includes a sample horse measurement chart, a comparative measurement chart for horses, and information on how to make measurement charts that meet your particular needs. 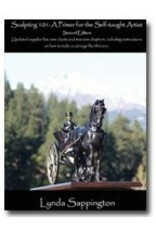 Intended for the novice through the experienced sculptor, this book can answer a multitude of "how-to" questions. The book is written in a friendly, conversational style. Here's an excerpt from Chapter 1: "Clays are wonderful to use because you can do both subtractive sculpting (where you remove material from the original sculpting medium - stone or wood, for instance - until you get to the finished look you want) and additive sculpting (where you add to the original sculpting medium, as you do with clay, metal, or paper). If you make a mistake in clay, you can fix it easily because the medium is so plastic (forgiving)." 8 1/2" x 11", 80 pages, fully illustrated.